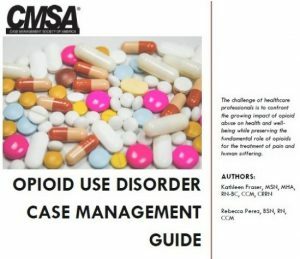 CMSA’s Opioid Use Disorder Case Management Guide was developed in collaboration with Reinsurance Group of America’s ROSE program and authored by CMSA’s Executive Director, Kathleen Fraser, CMSA Program Director, Rebecca Perez, and Senior RGA ROSE Consultant, Melinda Baxter. The abuse of opioids is a global problem that affects the health, social, and economic welfare of societies. The challenge of healthcare professionals is to confront the growing impact of opioid abuse on health and well-being while preserving the fundamental role of opioids for the treatment of pain and human suffering. This guide will assist case managers and other healthcare professionals in the assesment, care planning process, and intervention development to address opioid use disorder. This digital guide is one of the many benefits to CMSA members! Download your digital guide today! Click here to order your digital copy today! Upon ordering, watch for confirmation email for more directions on how to download your copy of the Opioid Use Disorder Case Management Guide. Chapter leaders may request a presentation on the Opioid Crisis through the Ambassador Program. Click here for more information. How are You Using this Opioid Guide? Click here to share information and feedback!